We love helping journalists and bloggers dig deep into Hungary’s culinary and wine culture. Don’t hesitate to reach out if you are headed to Hungary, hoping to head to Hungary, or are just doing some armchair travel writing. Taste Hungary is a multi-faceted company dedicated to showcasing Hungarian cuisine and wine to travelers. We provide memorable experiences which educate travelers about the region through its cuisine and wine, history, culture, and context in the larger world. Our experiences are focused on top quality local products, education, and passionate people. We draw on our experience, research, and deep personal connections to craft our tours, and choose our wines. We are also committed to making Hungarian wine accessible to our guests by offering services such as shipping, sales, importing to the US, and wine clubs. Taste Hungary was founded in 2008 by food writer Carolyn Bánfalvi (author of the award-winning books Food Wine Budapest and The Food and Wine Lover’s Guide to Hungary) and wine specialist Gábor Bánfalvi. Experiences — Taste Hungary is the leading culinary tour company in Hungary. We offer daily food and drink walks, wine tastings, wine tours, and private and custom tours for groups. The Tasting Table Budapest — Our independent wine shop and tasting room is located in central Budapest, where our sommeliers lead daily wine tastings, our wine store stocks 200+ labels, and we offer wine by the glass and flight. Wine Club —Regular shipments of our curated selection of Hungarian wine (along with an educational packet), available in the EU and the US. Wine Shop — Our online wine shop will soon offer shipping throughout the EU. Taste Hungary was founded in the fall of 2008, coinciding with Carolyn’s two books, Food Wine Budapest and The Food and Wine Lover’s Guide to Hungary, were published. The books were the first guidebooks in English focusing on Hungarian food and wine, and were the inspiration for founding of the company. They gave Taste Hungary its platform, and we quickly became recognized as local culinary authorities and Hungary’s leading food and wine tour company. The first tours which we offered this year were private market tours and private wine tours. In our first year we had a total of four private tours! We are proud that the very first customer for a private market tour remains a big fan of ours and has been returning to Budapest almost every year since, always coming back to us for a different experience. Our tour offerings and services have steadily expanded since then. 2009 was our first full year in business. We started running monthly group wine tours (for 15 participants), which became popular with locals. 2010 was the year when we became listed on Trip Advisor, which became a major source of bookings. 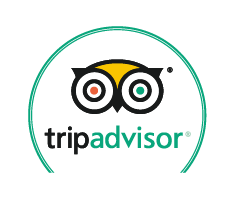 Trip Advisor continues to be very important for our business and we are proud that we have consistently had top ratings and stellar reviews. This year we also got our first mention in The New York Times! 2011 a group from Zingerman’s Deli and Zingerman’s Bakehouse (which are culinary institutions in America), visited us from Michigan, USA. We spent a few days with the founder, Ari Weinzweig; Amy Emberling and Frank Carollo, who run the Zingerman’s Bakehouse; and Molly Steven, a well-known cookbook author. We helped them fall in love with Hungarian food, and from this time, they have done lots of work promoting it! They even have a soup named after Gábor (Gábor’s Hungarian Bean Soup) which is served every Tuesday. This visit helped turn Zingerman’s into one of our most valuable partnerships (and we highly recommend paying a visit to them for some delicious Hungarian specialties if you find yourself in Ann Arbor). Read this excellent Zingerman’s newsletter for some background on our partnership, and for Ari’s take on Hungary. 2013 we organized our first ten-day-long culinary tour in cooperation with Zingerman’s, and since then the partnership has resulted a ten-day tour annually (now to Croatia also). In October Carolyn wrote the cover story for Saveur magazine on Hungarian cooking. This year we also happened to find a small cellar space, which was in horrible condition, for sale. We were having trouble finding suitable places to hold wine tastings, and so we had the crazy vision that this cellar could be a nice little wine tasting space for our customers. 2014 was a big year. We had 2,500 customers. In June we won a prestigious Drinks Business Award for Best Contribution to Wine and Spirits Tourism. We also opened The Tasting Table Budapest, where we can now organize tasting events in our own style and sell wine and curated food products. We had our first booking for a private wine tasting and cooking class on June 4th, and we finished the construction and cleaning at around 2am on June 3rd. The place still smelled like wet cement as we cooked! The Tasting Table is now an integral part of our business, and of our guests’ Hungarian wine experiences. In 2015 we continued to grow and develop new tours (including the successful Dinner Walk). This year we also started tours in Vienna—the Vienna Wine Walk and the Vienna Vineyard & Wine Tour—in cooperation with a sommelier in the city. Those Vienna tours lasted for about a year, until our partner sadly moved away. In 2015 we were shortlisted for another Drinks Business Award for “Best Contribution to Wine and Spirits Tourism.” Gábor attended the Digital Wine Communicator’s Conference (DWCC) as a guest speaker on a wine tourism panel. This year we had approximately 4,500 clients. In 2016 The Tasting Table got great press mentions in Vogue, Saveur, and National Geographic Traveler (among others)! Gábor was a speaker at the International Wine Tourism Conference (IWTC) in Barcelona. The Tasting Table was nominated for a Drinks Business Award for wine tourism! One of our proudest moments was when in June the Royal Tokaji Winery in Mád held a ceremony in which it placed two plaques (one in Hungarian and one in English) on their winery to finally acknowledge the Jewish family, the Zimmermanns, who lived and worked in the building, until they were deported to Auschwitz. For hundreds of years the family had been important vineyard owners, winemakers, and merchants in the Tokaj region. That all ended, and so did the significant Jewish presence in the Tokaj region. A few years earlier a few of the Zimmermann descendants (who now live in the US) booked a Tokaj Jewish Heritage & Wine Tour with us (and had since become friends) during which they discovered what had become of their family’s former residence. They realized that there was no mention of the family (or the village’s Jewish history) in the story on the web site detailing the fascinating history of the region and the winery. Several of the family members traveled to Hungary for the ceremony, and we were proud to join them for the dedication of this important plaque. Read articles about the effort by Alice Feiring, in Wine Searcher, in Reuters, in Tablet, and in Wine Sofa. In 2017 Taste Hungary won the award for Best Wine Tour Operator from the VinCE Wine Show. The Tasting Table joined the Egytőről wine bar collaborative, through which we played a part in creating two vintages of wine while helping to promote each other. In 2018 —for the second year in a row—Taste Hungary won the award for Best Wine Tour Operator from the VinCE Wine Show. The Tasting Table was recommended in the “36 Hours in Budapest” column in the New York Times! The big project this year so far has been revamping our web site and upgrading our booking system. This is also the year when we are finally making good on our long-time dream of importing Hungarian wine to the US and starting a Hungarian Wine Club. In 2019 … We can’t wait to see what happens! For all media-related enquiries, please contact co-owner Carolyn Banfalvi at carolyn@tastehungary.com. We are happy to provide a downloadable collection of low-res photos, which can be used for editorial purposes only. Please credit Taste Hungary. Contact us if you need additional photos or if you’d like high-res photos.